Some of the best movies ever made go hand-in-hand with some of the best film scores ever composed. Take The Godfather’s score, for instance, which transports you to the Italian countryside, or the opening notes of Star Wars, which get your blood pumping for a thrilling space adventure. But composing scores for films with scientific themes may not seem as straight-forward. For example, what music would you use to describe “geologic change”? What does “genetic adaptability” sound like? Those are questions that film composer Darren Fung had to answer when we he was tapped to score the three-part CBC/PBS documentary, The Great Human Odyssey. Darren talks with Ira about the technique of scoring a science film. Below are clips from the documentary, which were composed and conducted by Darren Fung and performed by members of the Edmonton Symphony and Pro Coro Canada. “This cue deals with the instability of the environment being a big driver of human evolution. Changes in the environment were constant, fast, extreme, and dangerous. Wet to dry, and back to wet again; fertile lands to desert wastelands—how did humans survive all of this? How did we avoid extinction? It’s our ability to adapt. As an example, during this cue, we talk about humans using ostrich egg shells to carry and store water. To purchase the full soundtrack to The Great Human Odyssey, click here. Darren Fung is a film composer in Valley Glen, California. IRA FLATOW: Some of the best movies ever made go hand-in-hand with some of the best film scores ever composed. Think “The Godfather” or “Star Wars.” The music complements the drama playing out on the screen. It heightens our emotions, it connects us with its characters. But science films, well, they can be a little trickier. Abstract concepts, dry story lines, no lead characters. For example, what music would you use to describe geologic change? What does genetic adaptability sound like? Well, if you can’t imagine it, just ask my next guest. Darren Fung is a film composer, most recently for the three part science series, “The Great Human Odyssey,” which aired on PBS this past October. Darren, welcome to Science Friday. DARREN FUNG: Thanks for having me, Ira. IRA FLATOW: Darren, you were tapped to score this documentary even though you say you weren’t really a science nerd in school. So why did you take this project on? DARREN FUNG: To be perfectly honest, when [INAUDIBLE] first approached me to score the film, I was kind of going like, I don’t really get it. When I first started understanding the story of how humans were able to adapt and how they were able to persevere through all these difficult adversities, I think it makes for an incredible story. All the big emotions that you’re looking for, there’s adversity, there is mystery, all these sort of things. And that’s what makes a great film score. And you tie that in together with science. I’ve learned so much about evolution in the process of doing the score. It’s really fascinating material. 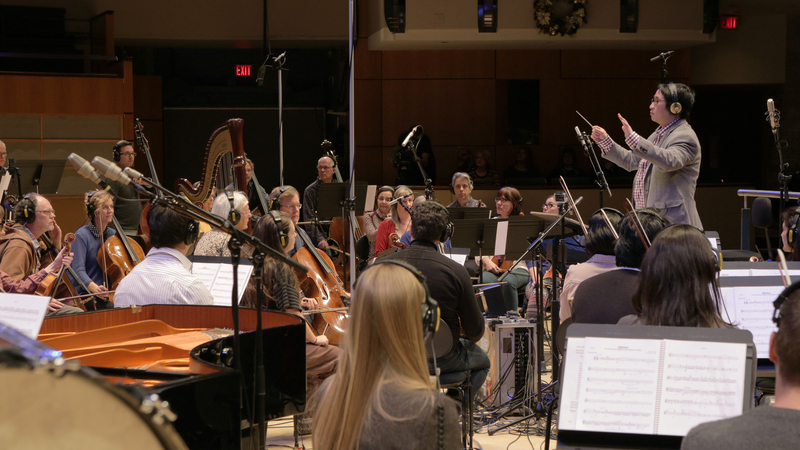 IRA FLATOW: Is scoring science any more difficult than scoring other kind of films? DARREN FUNG: I think that when you score science, you have to figure out a way how to tie those abstract ideas, the ideas that don’t necessarily have the emotional core to it and figure out how to translate that into emotion. And I wouldn’t say it’s more difficult than other film scores, but I think that it’s a little bit more of a stretch to draw that line. And a lot of that depends on the director and how his interpretation of it. As a film composer, you are always at the service of the film and to the director. And that director’s vision is always key in how you take that musical interpretation. IRA FLATOW: I guess you’re trying to find some sort of emotional background behind the science, whether as you say, it’s evolution or any kind of emotion behind that. DARREN FUNG: Absolutely. And to give you an idea, when we’re looking at some of the more investigative things, taking a look at, well, how do we survive through the ice age. Let’s look at how did art come to be. How did we move from Africa into Europe? Those sort of things, you take a look at what does emotion– again, a lot of it is mystery. A lot of it, there’s grandeur to a lot of the stuff. Some of it is incredibly magical, a little of the emotion that you latch onto. And that’s where the film composer, that’s the kind of thing that you’re like, wow, I can really spread my wings and show what I can do with that. IRA FLATOW: I’m Ira Flatow. This is Science Friday from PRI, Public Radio International, talking with Darren Fung, film composer, most recently for the three part science series, The Great Human Odyssey, which aired on PBS this past October. All right, let’s have you talk us through some examples for some clips. DARREN FUNG: So the first clip that I want to talk about is a cue that’s called Change Is Constant. And this cue deals with the instability of the environment being a big driver of human evolution. Changes in the environment, they were constant, they were fast, they were extreme, and they were dangerous. The earth went from wet to dry and back to wet again. How did humans survive all of this? And how do we avoid extinction? It’s our ability to adapt, and as an example, we talk about human ability to use ostrich eggs to carry and store water. So how do we score this adaptability? I don’t really think you score adaptability, but again, it’s that emotion. You score the danger, the apocalyptic nature of these extreme environmental changes. And then you move into something a little more inquisitive when you talk about innovation and adaptability, something a little more quiet, something a little more pensive. And then finally, you return to something bigger when we see something almost angelic and miraculous when you talk about the ingenuity and the resilience that help us realize, wow, ostrich eggs can hold and store water, which is really quite amazing. IRA FLATOW: OK, let’s hear some of that clip. IRA FLATOW: That was beautiful. Did you find that the choral music, the choral part was important to bringing that emotion? DARREN FUNG: Absolutely. I think one of the things that [? Naomi, ?] my director and anthropologist filmmaker friend, he was actually pushing really hard to add choir. Part of it is that we are talking about humans and there’s that little human voices. But I think that the choir adds such an added level of emotion. The natural voices just elevated to where– an orchestra is obviously fantastic, but again, choirs just reach out and grab you and give you goosebumps. IRA FLATOW: It does. Let’s talk about another clip that you brought with you. DARREN FUNG: So this clip here is called The Dawn of Symbolic Thought. We’re in Africa and we’re looking at symbols on cave walls here a little bit. And the more we do that, we travel to Blombos Cave in South Africa looking at an archaeological excavation. And the possibility of what humans can record. As we traveled to Blombos, we realized the scientific significance behind what is there. It’s often been called the cradle of the human mind, and so the music has to play homage to the significance of Blombos and why we build and we climax in the music there. IRA FLATOW: OK, let’s hear it. IRA FLATOW: It certainly has a dramatic buildup at the end. DARREN FUNG: Absolutely. And again, we’re going into an archaeological dig. If you’re kind of looking from a typical Hollywood perspective, it’s not, perhaps, the most exciting thing. But you have to realize that this place is huge. Blombos, it’s, again, the cradle of the human mind. And it’s my job to help the viewers realize the significance of all of these things. IRA FLATOW: You’re also working on scoring a virtual reality project right now. What extra things do you need to take into account when you do VR? DARREN FUNG: So right now I’m working on a little working project called Dogs Wearing Rubber Suits. And it’s a little bit of a joke, because it’s about sea lions. And we’re looking at this incredible image of sea lions just swimming around, being playful, and just exploring their environment there. One of the things that when you work in a non two dimensional environment is that that actual spatial perception really heightens that emotion a little bit more. I remember the first time I worked not so much in VR, but in 3D, and then going to the actual screening of a film and seeing smoke and fog. Smoke and fog in 2D is one thing, but when you go into 3D, then it heightens that emotion a little bit more. So you have to have a little bit of an imagination to be able to say, wow, OK, I see this on a flat screen, but how am I really perceiving this. And I think that you have to step up your game a little bit in the sense that you have to bring that emotion to match that level that you see in a multi-sensory world. IRA FLATOW: I’m looking forward to seeing that one, too. This is really interesting. I’ve learned a lot about film scoring today. Darren Fung, film composer, most recently for the three part science series, The Great Human Odyssey, which aired on PBS this past October. Thank you for taking time to be with us, Darren. DARREN FUNG: Thanks so much for having me, Ira. IRA FLATOW: Happy holidays to you. DARREN FUNG: Happy holidays to you, too, as well. Neuroscientist Daniel Levitin and Sound Opinions co-host Jim DeRogatis discuss the neuroscience of spooky songs. Ben Franklin's sonic experiments included inventing a new musical instrument and testing the limits of the human voice.